Many, many years ago, the Habsburg emperors lived in this imperial palace. Every Tyrolean kid visited the palace at least once during school; and let us tell you, it truly is beautiful. Even if, at a certain age, you stop dreaming about all these magical times of emperors, princesses and princes, it is still amazing to see how they lived. 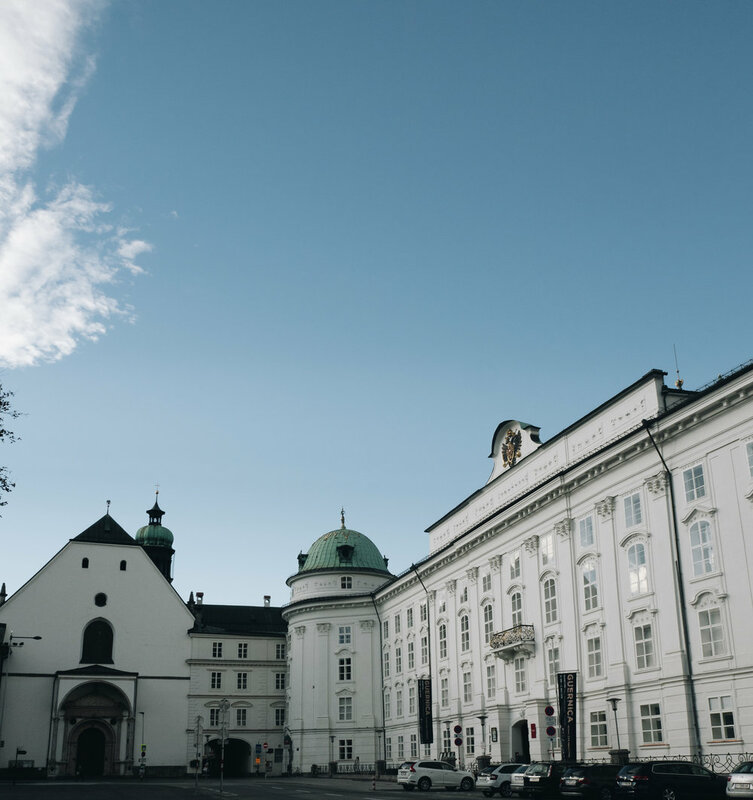 Since the Hofburg is very well preserved, it is definitely a must to see when in Innsbruck. Especially now, as 2019 is the year of the Emperor Maximillian I. A special lightshow is taking place at the palace every day. 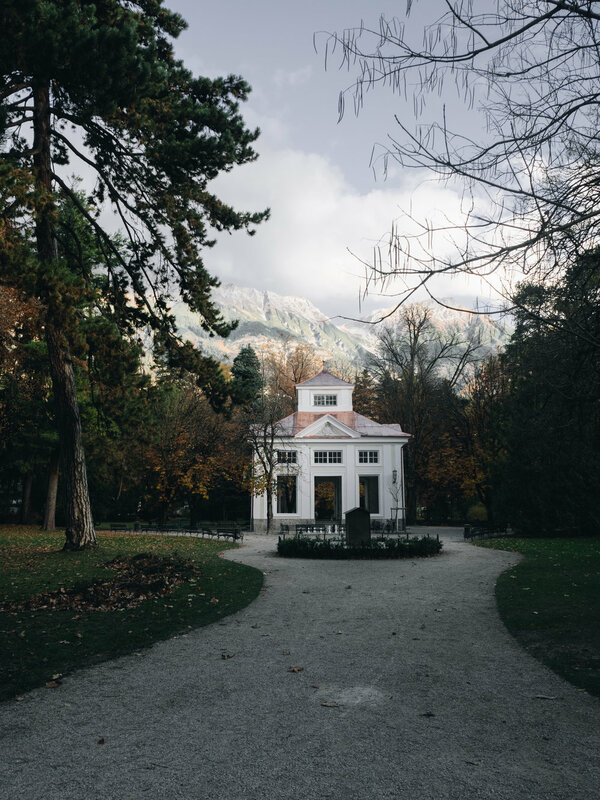 Just across the street of the Hofburg, you’ll find the Hofgarten, a park that, during summer, invites to just relax under a tree and do nothing or, during winter, take a walk with your loved ones when the trees are all covered in snow. Also, there’s a little café in the park where you can take a break (or go partying at night). Between the Hofburg and the Hofgarten there is the Landestheater, the Tyrolean State Theatre. They offer everything from musicals, to drama and comedy, to opera and even dance. If you follow us on Instagram, you might have come across us seeing “A Midsummer Night’s Dream”, which we enjoyed to the fullest! You should definitely check out their website to find out what they are playing during your stay in Innsbruck, as we already plan on seeing “West Side Story” in January. When admiring the state theatre, you might have also noticed the incredibly beautiful, modern, black building next to it. This is Innsbruck’s new House of Music, which was finished in 2018. Just like the state theatre, they also offer many great plays, concerts, culture programmes, and all sorts of different kinds of interesting events in the name of entertainment for everyone; and they have done so since the first, original “house of entertainment” had been built there in 1773. Now it’s time to talk about the most famous mountain range in Tyrol: the Nordkette. 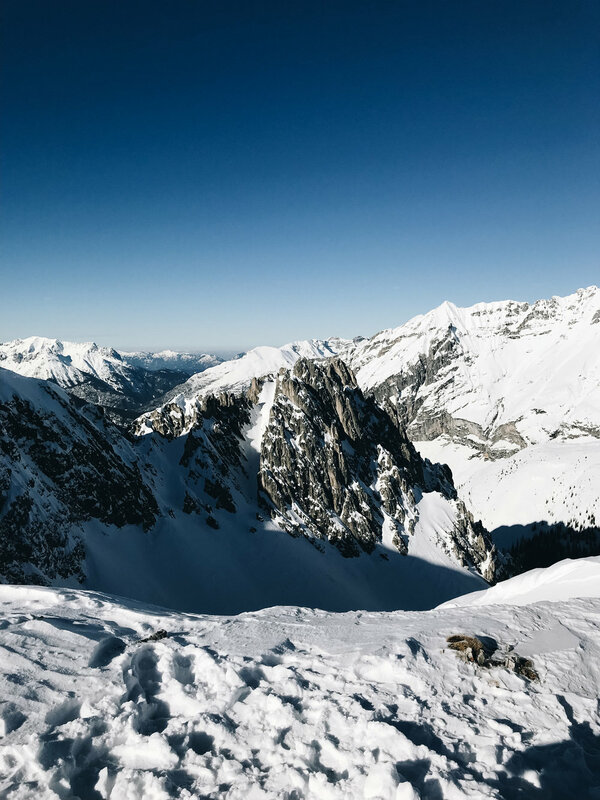 Since more in-depth skiing and hiking guides about this mountain range will follow sometime soon, we’ll now tell you a few more general things about the Nordkette. 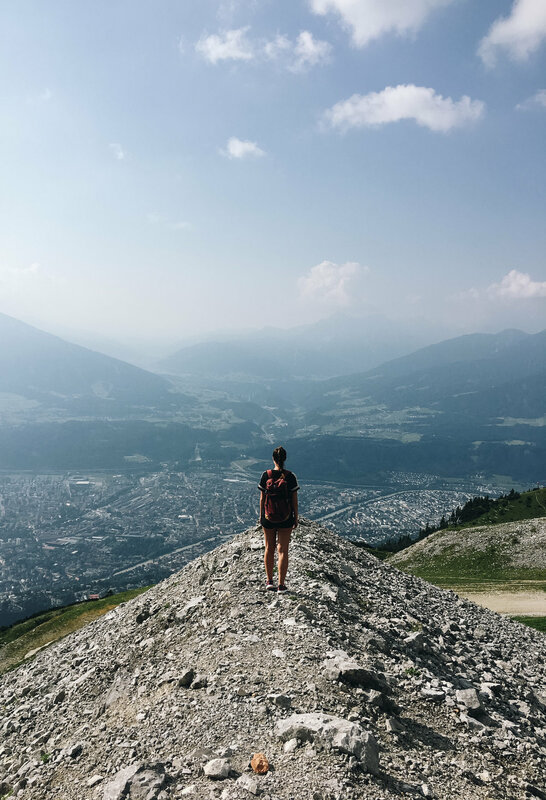 You haven’t been to Innsbruck if you haven’t visited the Nordkette. Even non-hikers should definitely go up there as the view over the city is incredible – in winter as well as in summer. 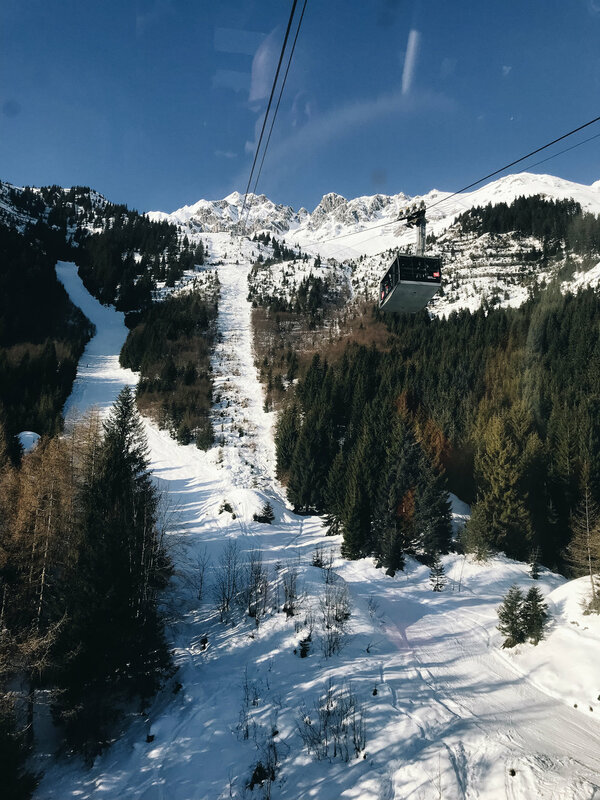 From the city centre, you first take the Hungerburgbahn cable car, which’s stations were designed by the world-famous late architect Zaha Hadid (she designed numerous incredible builidngs in Innsbruck). From Hungerburg station, you already have a pretty nice view of the city. During winter season, there even is a very small and cosy Christmas market, but we have already told you about that in our Christmas Market Guide for Innsbruck. From there, you take the Nordkettenbahn cable car to get to the Seegrube, where you’ll find a big restaurant and if you want to go even higher you take Section II of the cable car and get to the Hafelekar. If you are not impressed by that view, we don’t know what will! We really hope you also liked the second part of our Beginner’s Guide and we can’t wait to show you some more unknown and hidden places of the city!